Holding A Property? What is it Costing You in Los Angeles? Are you holding on to a property in Los Angeles and you aren’t exactly sure why? At some point it may have made a great deal of sense, but does it still? Every day that you continue to “hold” the property, you are spending money and you may not even realize how much. Before you keep it for another day, consider the following points. It might be time to rethink about selling your Los Angeles house! 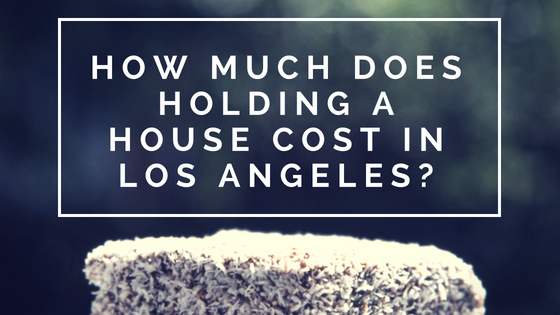 How much does it cost to hold a property in Los Angeles? Read the rest of the blog to see just how much. Ask any real estate investor and you may be told the following: the faster you finish the flip, the more money you will make. Plain and simple, owning real estate costs money. And if you are holding on to the property for sentimental reasons or because you “might” use it one day, you are probably throwing your money away. The property you own should be working for you NOW. It can be your primary residence, providing a monthly income, or be used for vacation or second home purposes. If your Los Angeles house isn’t providing you with one these things, it might be time you consider selling that property! Property taxes can be pretty expensive depending on when you bought the property. With the most recent changes to the tax code, did you know that they are no longer deductible? As long as you are listed as the owner of the home, you will be responsible for the taxes on it. By selling your house in a timely manner, you can immediately end the property taxes that you are required to pay for the home. Believe it or not, the monthly utilities add up quickly. If you were to add all that you’ve spent on electricity, water, gas, tv, cable, and Internet you might be surprised at how high that number really is. Even if you aren’t residing in the home while selling it, you will still need to keep the lights and the water on for the people who come to see your house. If your house is older and less energy efficient, you are likely to have utility bills significantly higher than what you would find in a new home. How much should you plan on spending on maintenance and repairs? A good rule of thumb for these costs is using the one percent rule. This rule states that you should plan to spend about one percent of your purchase price on maintenance each year. For example, if your house was purchased for $250,000, you should plan to spend about $2,500 on home maintenance each year. Of course, these numbers can vary widely, but many investors use this formula to estimate costs. Bottom line, you should plan on spending something on your house each year to ensure that you keep your house in great shape, which will help avoid bigger problems down the road. A typical homeowners insurance policy will vary based on the house and its location. You can expect to pay over $1,000 annually for an average Los Angeles house. Having earthquake insurance is a heavily debated topic. After all, it is expensive. But, what is more expensive is the cost of rebuilding your house after an earthquake deems it uninhabitable. If you have read anything in the news lately, you know that experts are expecting a major earthquake in California soon. It pays to be prepared. At a minimum, use some of your maintenance and repair money to have your house bolted to its foundation. That is money well spent and is a great selling point for your house sale. Plus, you can get a discount on earthquake insurance when you show that you had this completed. This is by far the biggest monthly cost associated with holding a property. It can be difficult to come up with a mortgage payment each and every month for a property that you don’t want to own anymore. The average mortgage payment nationwide is well over $1,000 each month. In Los Angeles, it’s closer to $2,500 to $3,500. That’s $30,000 to $42,000 per year! Imagine the relief you would feel in not making that payment every month. Bottom line, some people are struggling to pay the thousands of dollars each month on their mortgage, when in reality, they would be way better off selling the property. As you can see, selling your house now as opposed to later can enable you to keep more money in your pocket. For every day you continue to own it, you will also continue having to be financially responsible for it. The bills and maintenance costs add up quickly. Run the numbers for yourself and make the decision that makes the most sense for you!